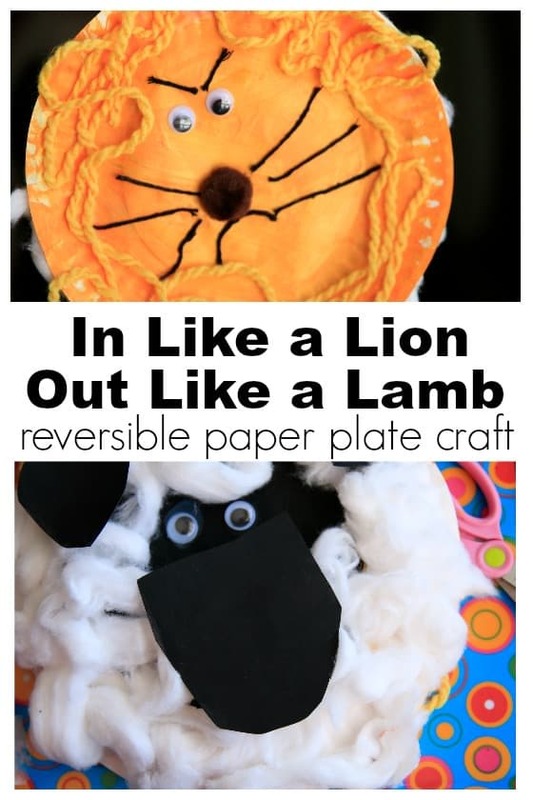 Here’s an adorable Lion and Lamb Craft for March 1st. Remember the old saying “In like a lion, out like a lamb”? 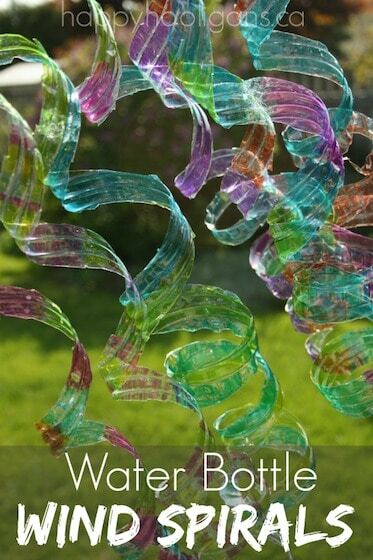 Well, we’ve turned that classic idiom into an easy spring craft for kids to make to predict the weather this March. They giggled and looked at me like I was crazy. They’d never heard that expression before! Doesn’t anyone say it anymore? When I was a kid, my mom always got us pumped up about the arrival of March with the lion or lamb saying. If March comes in fierce like a lion, with snow storms and freezing weather, it’s said that it will go out like a lamb, with gentle breezes and warm sunshine. If, however, March comes in as gentle as a lamb, watch out! We’ll be in for a blast of nasty weather at the end of the month. Does it really happen that way? Not always, but it’s fun to make predictions, and see if they come true. The kids had some fun making their predictions, and I suggested that we make a lion and lamb craft to go along with their predictions. 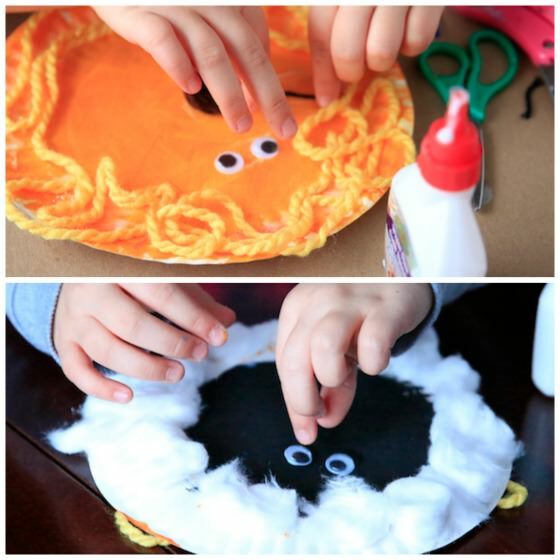 Instead of making separate lion and lamb crafts, I thought it would be fun to put the two together, making a reversible lion and lamb that the kids could flip it from one side to the other, depending on what their prediction was, and what the weather was actually doing. Using a paper plate seemed the most logical way to do it. 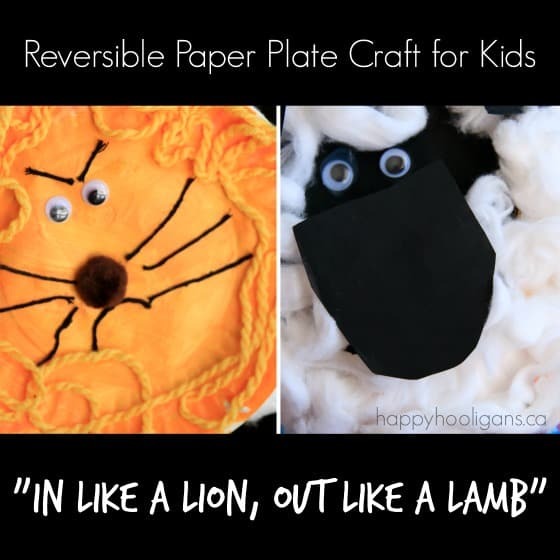 You know we love our paper plate crafts! I LOVE the way this craft turned out! 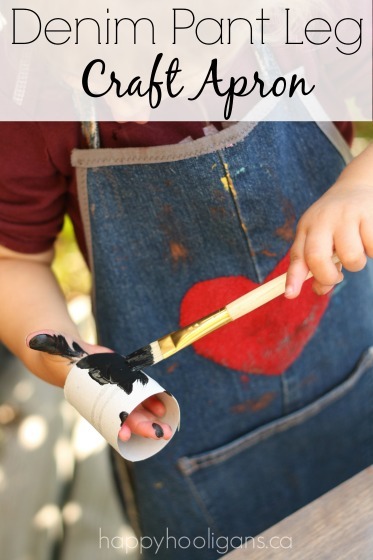 It was really easy to make, using supplies and materials that we already had around the house, and there are some fun textures involved for little hands to explore. 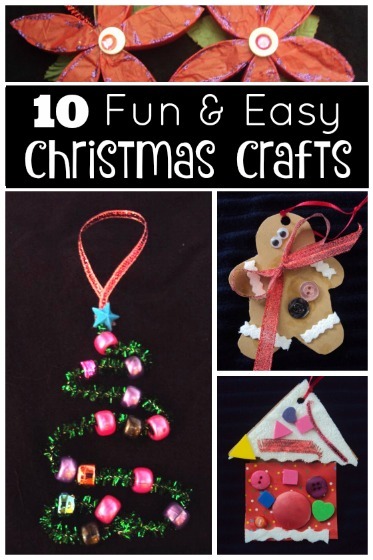 What a great craft to illustrate a favourite saying from the good old days. 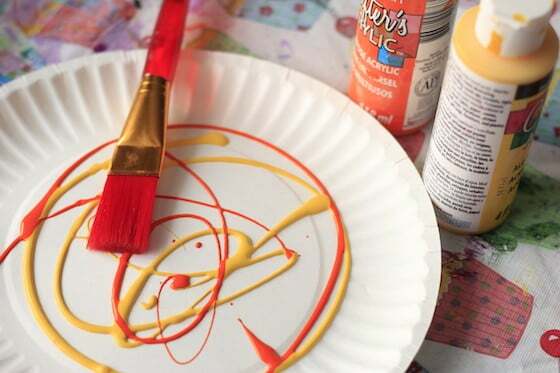 We painted our plates with a mix of yellow and orange paint. We went a bit heavy on the orange. 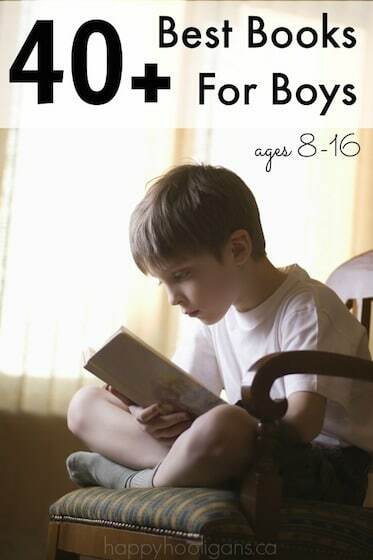 You don’t need to add as much as you see in the photo here. 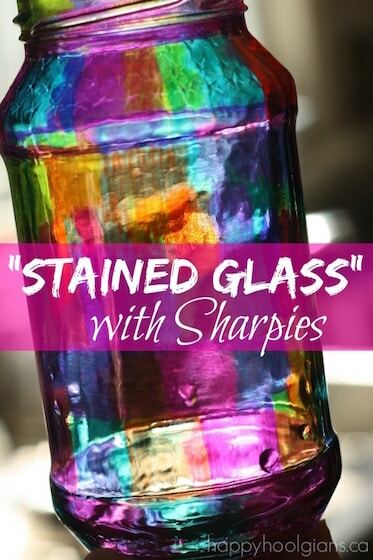 We ended up adding more yellow, and we even found some gold metallic paint to give it a shimmery look. When the paint was dry, we made our lion’s mane. 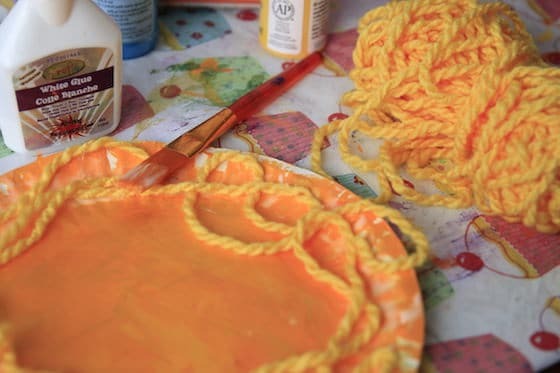 We brushed a layer of glue all around the rim of the paper plate, and then with a very long piece of yarn we went around, looping and swirling the yarn and pressing it into the glue. I think it made for a very fine mane, don’t you? Next, we moved onto the lion’s face. 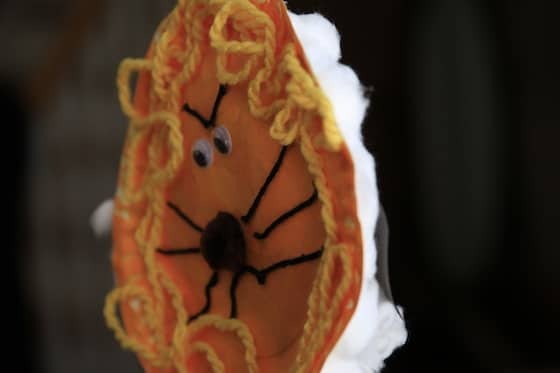 We glued on googly eyes, added a pom-pom nose, and some yarn whiskers. 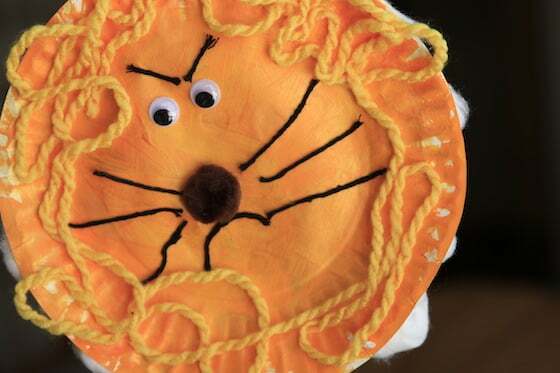 We weren’t sure what to make our lion’s mouth with, and ended up experimenting with a piece of the black yarn. A frowning mouth seemed most appropriate as we wanted our lion to look fierce. One of the hooligans suggested angry eyebrows too, which really perfected the look. Leave your lion to dry for a while before flipping him over to make your lamb. 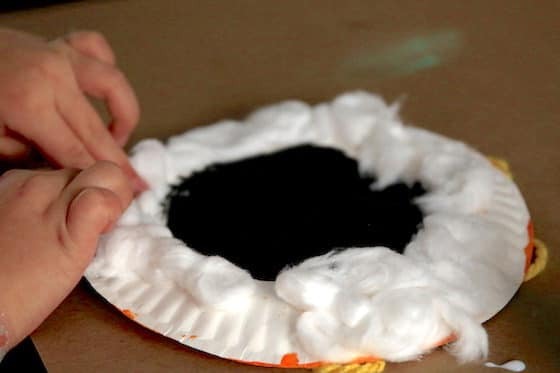 For our lamb, we painted the centre of the paper plate black, and then the kids pulled and stretched several cotton balls and glued them all around the plate to give our lamb lots of soft, fluffy “wool”. 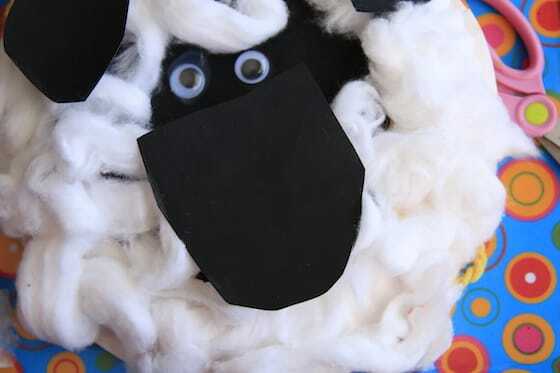 For the lamb’s face, we added a couple of eyes, and then added a black nose and ears which were cut out of black card stock. How adorable is this little guy?! Here’s a side view of our completed craft: lion on one side, lamb on the other. We punched a hole in the top of the plate, and looped a piece of yarn through for hanging. 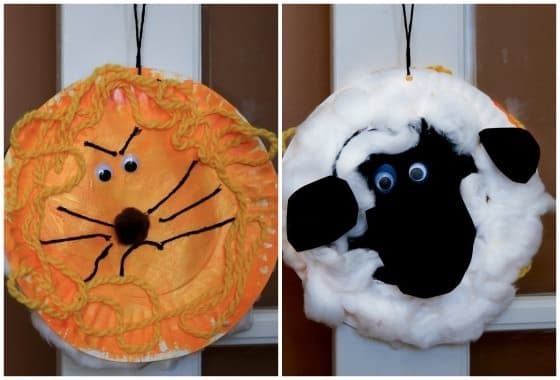 Now our lion and lamb craft hangs on a doorknob where the kids can reach it and flip it around whenever they change their minds about their weather predictions. I’m curious to see which way it will be facing when March arrives. Will it come in like a lion or in like a lamb? The mild weather we’re experiencing this week has us all predicting “lamb”! 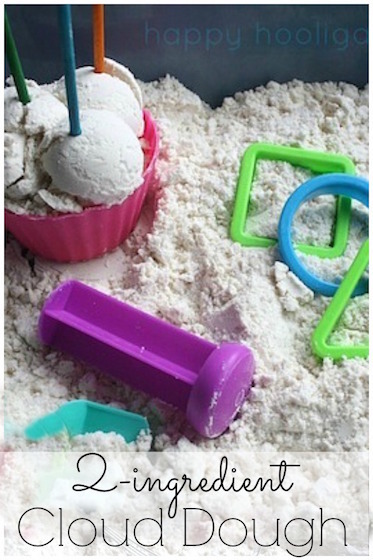 Now that spring is on it’s way, check out these fun and easy craft ideas! How cute! 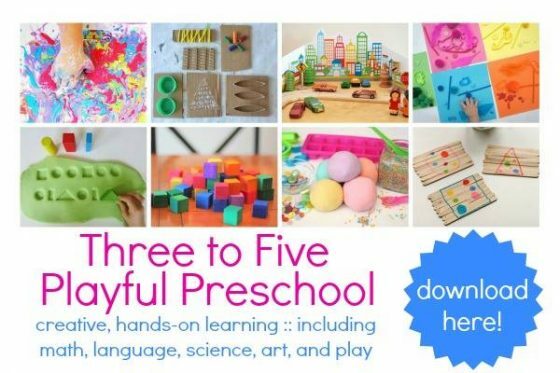 That looks like a great craft to have fun making and to have talking to your child about what it means. I am pinning it!